Having strong and stubborn management skills is extremely necessary if you are in a management job or aspire to become one. When you are leading a team of professionals, you need to have the people skills in order to make them follow your orders, lead them in the right direction and also for handling your clients well. Good people skills include one’s aptitude in proper listening and communicating. Also in relating to people on more than one level – professional as well as personal level, people skill has its own perks. 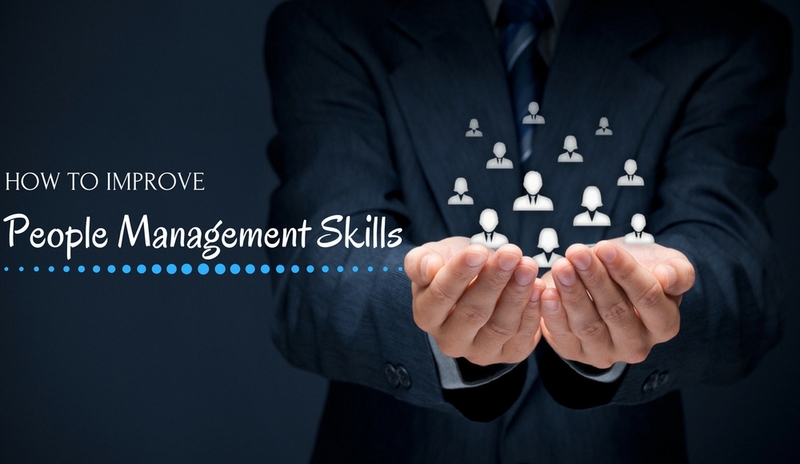 Some other people skills that can help management people, in the long run, are the willingness to look into their matters and resolve the issues in which they face difficulty, an empathetic attitude, working with them not just to get your own job done but to actually fulfill a mutual objective. And perhaps the most important of all, which majority of them forget to adapt is patience. You cannot always expect people to understand from an intellectual’s point of view, so patience is must when making them understand a point or convince them. Written down below is a list of improvements that you can make to be praised in your job and be really good at it. If you are working on a project and leading it, you would generally divide the work like – research, presentation, field work, budget planning etc among several of your team members. But sometimes, people are finicky enough to not do so. They cannot put their trust on others and do not think someone, in particular, is responsible enough to get the job done. Therefore they take the charge over themselves. This can have several bad impacts. Firstly, you would end up overly stressing with a huge load of works. Secondly, you can either make your team members lazy or directly portray that you do not think them efficient enough for the task. In both the cases, you would be the one to suffer because, in your next project, they would either be lazy or inactive. On the contrary, you can actually make a droopy guy work harder by setting a deadline for him/her. So, keep your faith intact in others. Not everyone has similar calibers or weaknesses. Whereas someone else is better at interaction and communication, you can easily place your trust in others. You do not have to feel bad about not having enough of all the skills. Take online personality assessments tests or have a face to face chat with a helpful senior. Work on the places you lack. Read online books on how to develop your personality or make it more likable and presentable. And work on the parts to be at par with others. One thing to remember here is – your team is dependent on you. You need to share your plans with them from beforehand so that they can get clarity on the idea and start working accordingly. Your flaws and skills would be best known by the people you are working with. From time to time hold a survey, ask your teammates to remain anonymous and write down on a piece of paper about their areas of satisfaction and dissatisfaction of working with you. Also, you can directly hold one to one meetings to ask them about how do they think of you as a leader, or what is your room for improvements. Improving by introspection is not everybody’s cup of tea and you might be one of them. Even if you are, there is no need to feel low about it. Often there are colleges or universities that offer courses on leadership programs or people skills. Besides, if you do not have time enough to attend a regular program, there are several online courses for the same. Try looking for some, and do not hesitate to join as soon as you feel the need for it. Not every time people are going to agree to your perspective and vice versa. That does not necessarily mean either of you is wrong or the deal is off. For developing the ability to relate to others, you need to have a whole lot of experiences and a well pruned flexible personality. You cannot be bossy with everyone around you. Try placing yourself in their position and think what would you have done or how would you have fixed a particular situation. As Taylor puts it, “If you have the gift for the spoken and written word, you will always put your best foot forward. Being articulate is highly prized in today’s workplace when the time is at premium and technology requires constant communication.” Being just competent would not probably fetch you a high score on management skill. You need to have a charismatic personality so that people would actually listen to what you have to say. Don’t make your meetings one-sided, make them interactive. Start with “We” rather than “I”; it’s not only about you all the time. The task would require their diligence and dedication as well. Involve them more in the work; ask them if they think there is any room for modification or change. In today’s world, people lose their temper in seconds and that really cost them a lot. Being a Management guy, you definitely don’t want that to happen with you. Losing your head in the midst of a meeting or a client deal can create a bad impression of you. Books are probably the first and best way to learn anything. Facing the same difficulty at work each day would not probably help you in changing your perspectives. Therefore you need to consults books. Learn more about your issues from the experts before you set to work on improving your people skills without even knowing probably where to start from. Whether you are a leader, boss or a just a team member, the stress is really high at workplaces for everyone. Yes, of course, the stress level differs but it does not vanish if you are not a boss. Therefore, occasionally make your fellow mates or colleagues laugh by introducing something trivial. Not everyone has a great sense of humor, therefore you can actually inculcate it or it’s obviously an advantage if you already possess that. However, it is also important to know when to introduce some lighthearted topic. Do not obviously crack a joke in the middle of a meeting. Think and rethink before blurting anything out bluntly. You need to have a proper knowledge of how to present things to someone, be it your boss or a very significant client or anyone else. You need to verify the current situation before you break news. For instance, if someone’s mother is admitted to a hospital and is in a critical condition, you cannot break them the news of your promotion. Many people terribly fail at understanding others emotions even though they are good with other skills. This is something that at times you need to feel rather than just know. Honesty can be of immense aid in climbing the steps to your success. For instance – if you have done a mistake in your task or a project, no matter whether you are the captain of the team or not, admit it. Honesty is praised all over all the time. Denying your fault or mistake can put you into a bigger trouble. On the other hand, speaking up of something that had gone wrong is wise since there’s a chance that it can be mended while there’s still time. Your body language speaks almost half about you. Even when you are not speaking in real, your body speaks all the while. Eye contact, hand movements, the way you smile – everything is noticed keenly by people around you. Your gestures should be proper, your expressions clear and loud, voice soft and sturdy and appearance neat and tidy. Management job keeps you constantly communicating with people; therefore your body language should speak for you. For instance – you should not behave too close with any of your colleagues or employee if she does not like it. Don’t be bossy, but keep your position upright. Tough situations arising at jobs are almost a regular thing. But you need to be active enough to resolve them and not keep them for later. Everyone admires a person who can solve their difficulties, therefore help people whenever they need you. Try not being too competitive at the workplace, if your fellow mate asks for your help do not think he is asking for a favor or your help can retrace your own performance. On the contrary, people would remember you and you can develop a healthy rapport with others. If someone is going through a bad phase, try stimulating them up by saying something cheerful. But do not sound like you know it all. For instance – if someone is consistently doing poor in their tasks, try having a heart to heart conversation with them. Know where the root of the problem lies and advise them in accordance to that. They might not understand a particular concept or a strategy, listen to them and help them out. Do not take people for granted, this goes very perfect for people in management jobs. Just as you would like to be appreciated, so does anyone else. If you need something from someone, say “Please” and after you get the help say “Thank you”. These are manners that can be very fruitful to you in the long run. Besides acquiring good communication skills, you also need to be persuasive enough. Whether in a client deal or in meetings or on the field with customers, people should be convinced by the logicality of your words. There comes a time in jobs like these when you need to sell others on your words. Starting from the very basics like job offers and discourses on salary to dealing with annoying or rude clients, your negotiation skills can fetch you good marks on your annual report. Besides considering others ‘difficulties, you also need to think about your tight position. Hence, it is sometimes needed to make people think in your way and make it work. However, that should not be by power or force but by your influence. There is a vast difference between just putting ears to what someone has to say and listening to their opinion or proposal actively. In most of the workplaces, the employees have a serious complaint that they are never heard, and that makes them feel neglected. So, gradually they stop speaking and just follow their orders. Also, there is a tendency in many to listen half of the things and start forming a reply in their minds to counteract them. Remind yourself, it’s not a debate where either of you has to win. Evaluate their possibilities. Anyone’s proposal might actually turn the topic of discussion to a deeper level. Even with clients, just putting your conditions before them is not enough. Consider the fact that they might actually have something to say. For most of them, leaderships fail because the leaders tend to be very messy. There are things all over the place. Added to that they are unsure about everything and is in the habit of procrastinating. They are neither confirmed about strategies, dates, data or objectives. So, if you are one of them, start keeping a track of your schedule at work. Write everything down and set reminders. If you can follow up with the list that has been provided, you will surely be doing good very fast. Previous articleHow to Give Self Introduction in Interview Easily? Next articleHow to Write a Resume for the First Time?